The key to understanding a weaving draft is to imagine that you're hovering above your loom and looking straight down at it. Reading from right to left, the top gives you the warp colors to put through the slots and holes (threading order). 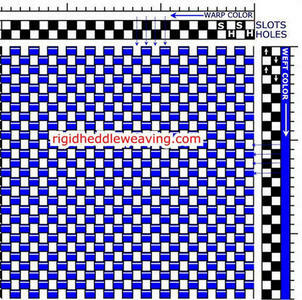 Reading from top to bottom, the right side gives you the weft color to weave by bringing the rigid heddle up and down. Additonal detailed explanations of how to read a draft may be found on my sister site Joy Of Weaving. This video is for multi-shaft looms but the same idea applies. The only difference is that your rigid heddle only has shafts #1 and #2.